On 5 November, representatives in Jaipur came together to discuss new research that was recently launched on ways for businesses to catalyze the protection of children and adolescents from exploitative labour. The research highlights opportunities for promoting high productivity businesses using higher wage adult labour rather than child labour in Jaipur, Rajasthan’s capital. The report was produced by a team of researchers led by Dev Nathan and funded by the Freedom Fund and offers guidance for the joint efforts of business, government and voluntary bodies in Jaipur, supported by the Child Labour Free Jaipur program. The researchers spoke to 150 key informants with connections to the lac bangle, embroidery and gemstone production industries in the city. They found that within each of these sectors there was a low value and a high-value segment. Typically, the low-value producers tended to keep children in harmful and hazardous work and sell to mass markets, while the high-value segment employs adults with high levels of skills, though children are sometimes found in outsourced elements of the work. For products at the low-end, there was a general feeling of crisis due to increased competition from machine-made products and a stagnant market. In this segment, the researchers recommended investment in semi-mechanisation, so that adult labour on legal wages could increase production without increasing costs. They also encouraged more frequent enforcement measures and community mobilization against rogue businesses that persist in the abuse of children. For businesses at the high-value end, the research found that independent certification and labelling would help them work through their supply chain and demonstrate that they are free from child labour. 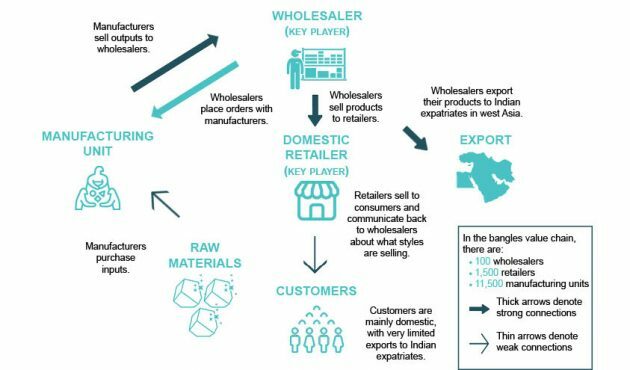 Lead firms in each of the supply chains, such as exporters, designers and retailers, have a vital role in setting the ground rules for how they do business. These purchasers often have stable contracting relationships with suppliers, which would make it easier for “child labour-free” interventions, such as certification, to be moved along the supply chain – but it will require a recognition of responsibility and increasing transparency by these lead firms. The report argues for a strategic transition away from child labour across these industries so that Jaipur can increase its overall competitive advantage, showing that the city’s economy combines quality crafts with upholding children’s rights. The Freedom Fund’s Rajasthan hotspot is implementing a Child Labour Free Jaipur Program that aims to progressively eliminate child labour through a united strategy involving apparel and handicraft businesses, the state government, enforcement systems and communities. Learn more about our hotspot.